Obesity is a growing concern in both developed and underdeveloped countries. Being obese and having a high percentage of body fat is not merely a cosmetic issue, robbing one of their looks, but in fact exposes the obese person to a host of health conditions. Fat especially around the girth has been found to lead to various health problems such as cardiovascular diseases, stroke, high blood pressure and diabetes. The increased weight also directly affects movement and flexibility. COCOLAB has developed a first-in-the-market formulation which combines the benefits of medium chain triglycerides (MCT) and provitamin A carotenoids that have been scientifically proven as an effective, natural and safe supplement against obesity. The Trimmax Belly Fat Burner formulation targets belly fat, which is stubborn fat that accumulates around the girth. It is a natural mixed-carotene complex concentrate that is predominantly a complex of alpha-carotene, beta-carotene, gamma-carotene and lycopene. This scientifically tested and formulated mixture has the highest ratio of alpha-carotene in the market. Using only the purest and highest grade ingredients, COCOLAB’s MCT Oil, is packed with Caprylic (C8), Capric (C10) and Lauric (C12) triglycerides. Besides aiding weight loss, MCT is also known to improve gut health, improve brain health and provide energy. 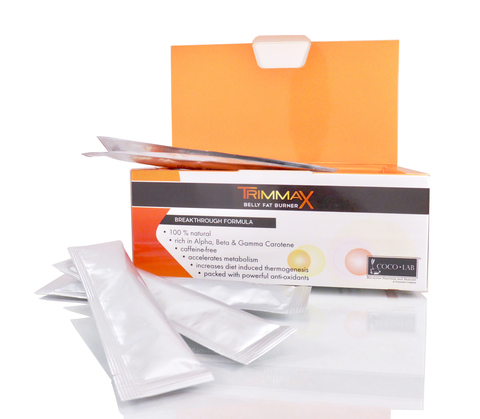 This formulation is readily and easily absorbed by the body to serve its benefits. A healthy system cannot be achieved without first addressing the metabolic health of an individual. 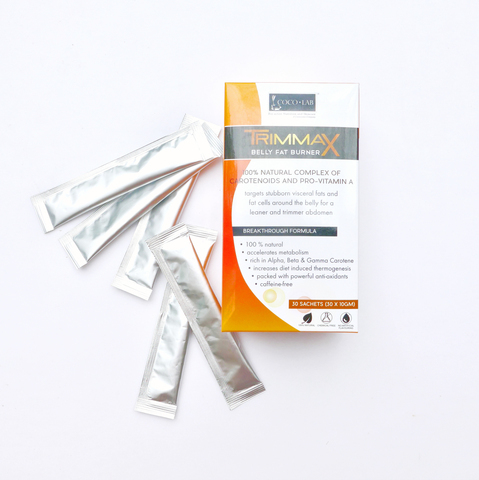 Supplementation with Trimmax Belly Fat Burner helps in the modulation of metabolic-inflammatory processes. Daily supplementation with this formulation will eventually address the problem of obesity among children and adults as well as regulate metabolic health and therefore reduce risk of chronic lifestyle diseases. 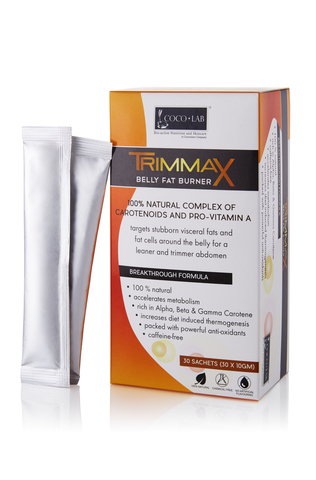 Research has shown that supplementation with COCOLAB’s Trimmax Belly Fat Burner has a positive impact on overweight children and adults. 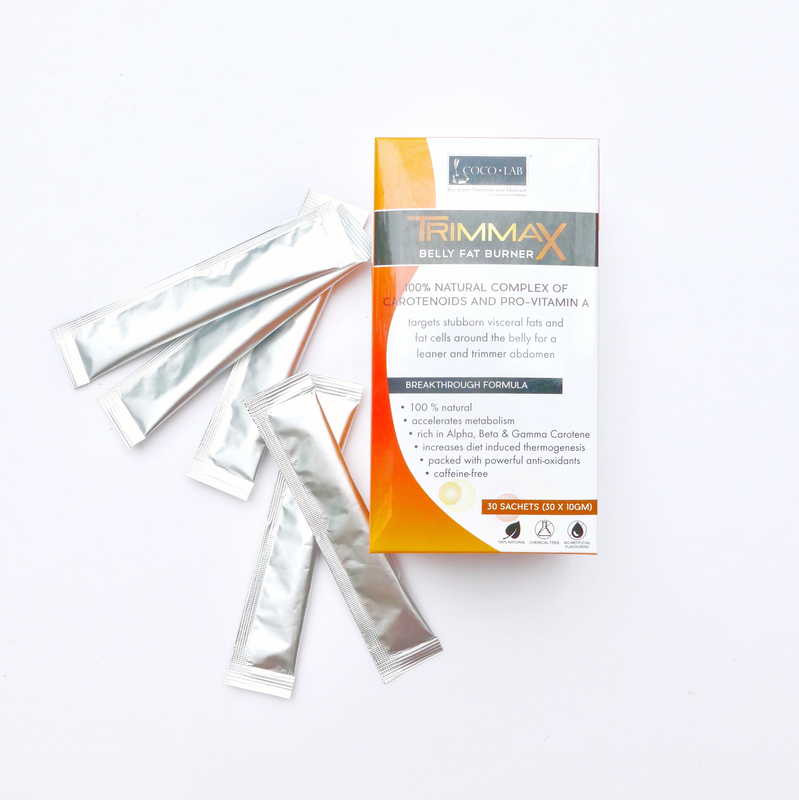 Individuals with concerns over waistline issues will find the Trimmax Belly Fat Burner especially useful as this formulation, when consumed, preferentially accumulates in the tummy region, targeting existing fat cells. 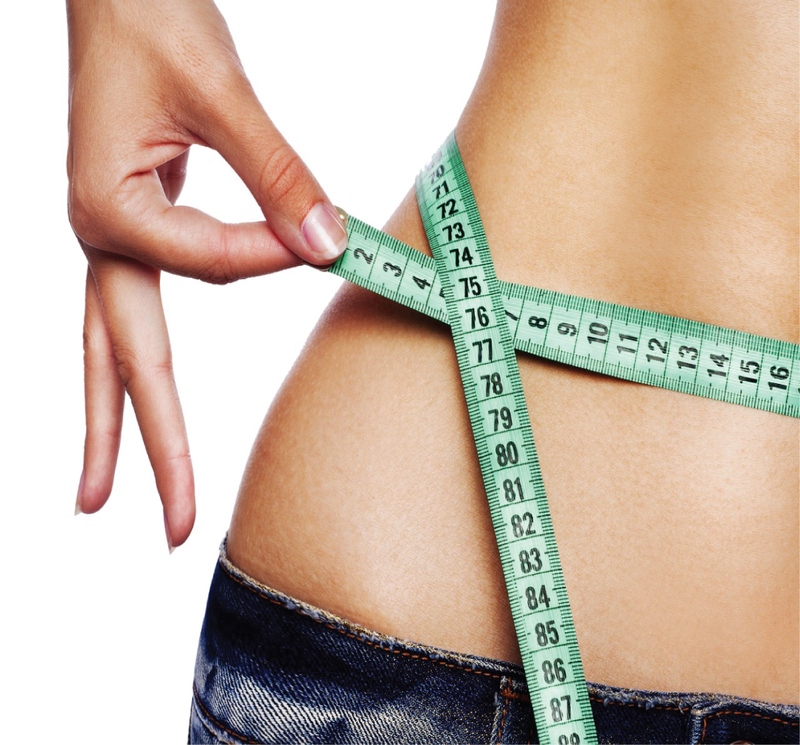 It actively inhibits the growth of existing fat cells and more importantly, reduces the formation of new fat cells. Additionally, the Trimmax Belly Fat Burner also targets excess visceral fats (commonly associated as stubborn fats) accumulated around the internal organs such as the liver, pancreas and intestines, inhibiting its growth in number and size. High amounts of visceral fat has been associated with a list of health problems including diabetes. Choose the Liquid Sachet form for a higher level of convenience. Easily carry required number of sachets according to your traveling and lifestyle needs. The recommended dosage is 1 sachet (10ml) daily in the morning. Tear off at perforated line on foil sachet and consume liquid. Take after meals. 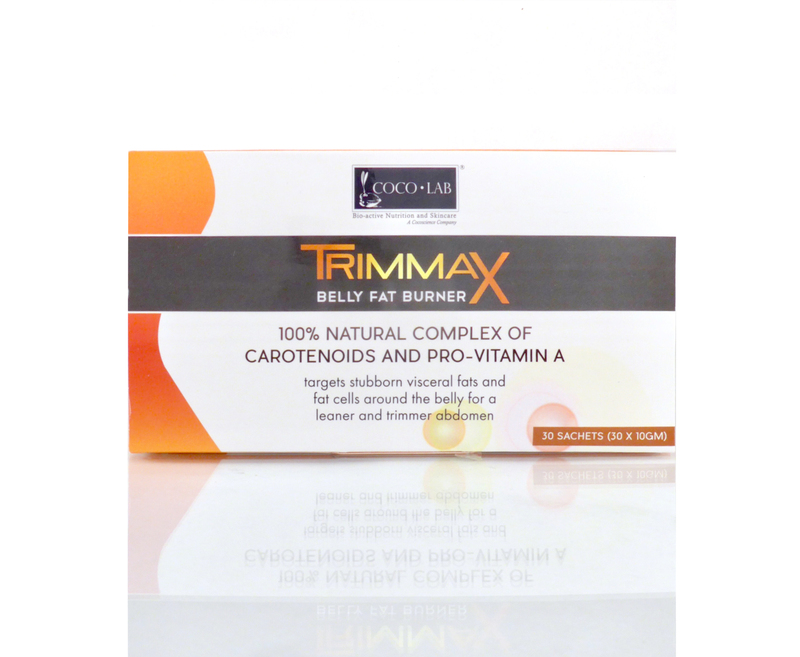 *each sachet contains 10ml of Trimmax Belly Fat Burner Liquid. *in some cases, you may pass motion. This is perfectly normal as your body begins to acclimatize to your new diet. You may opt to reduce dosage after your meals.